Ratheeb: Weapons of steel draw no blood from Refai bawas who demonstrate the power of faith at Kataragama. 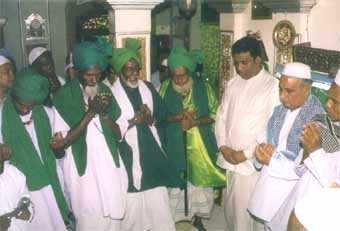 Trustee of the Kataragama Mosque and Shrine al-Haj M.L.A. 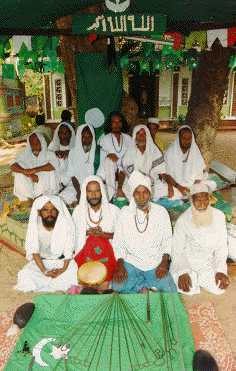 Gaffar, addressing the devotees at the Esala festival Flag-hoisting Ceremony on July 23, 1998, said that only at one place in the world do people of three religions worship together. Kataragama belongs to all the people of the world, not only to Sri Lankans. 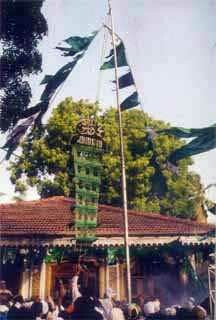 The hoisting of the Islamic flag to mark the start of the 16-day Esala festival is only one of Kataragama's many traditions associated with the Mosque and Shrine. The origin of many traditions are lost in antiquity.  Kataragama is renowned among pious Muslims the world over as Khidr-gama, 'the home of al-Khidr'. In Islamic lore, al-Khidr 'the Green Man' was the companion of Alexander the Great who discovered the ma'ul hayat or Water of Life. Al-Khidr will live until the end of the world and whatever place he visits remains fresh and green. He is also known as Hayat Nabi 'the living prophet'. 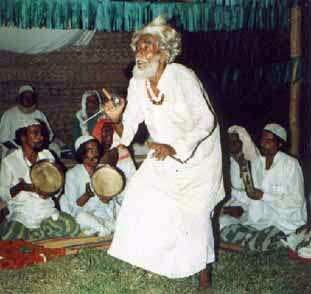 During the Esala Festival, Maulood is recited in the name of Hayat Nabi (Khidr alai) every morning. The final Thamam recital occurs on August 8 after the Buddhists and Hindus celebrate the Water-cutting Ceremony at the Menik Ganga. Following Thamam, a great feast is offered and the flag is lowered to end the festival. Throughout the Esala festival, bawas or faqirs of the Refai Sufi Order perform Ratheeb ceremony every evening at the Mosque. The dramatic ritual of self-mortification in the Name of Allah attracts hundreds of Muslims and non-Muslims. "Muslims call him Hayat Nabi," al-Haj Gaffar told the assembled crowd. "To Hindus he is Murugan. Buddhists call him Kataragama Deviyo."